Caffè del Doge Amadi & Sambucco is a wonderful Italian espresso coffee with 30% Arabica and 70% Robusta beans. This is an espresso blend for those who love a full bodied coffee with a long aftertaste. It has a distinct bitter taste with spicy tones of hazelnut, chocolate and caramel. 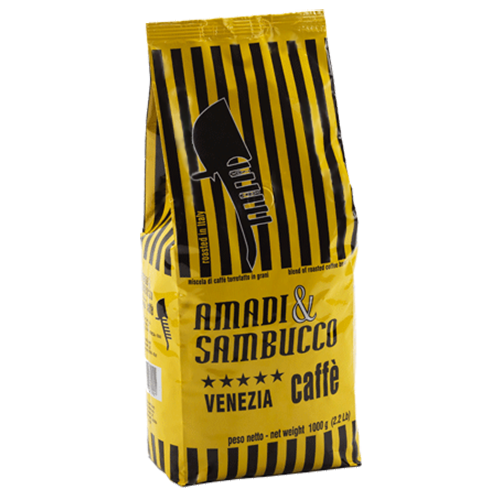 Amadi & Sambucco is roasted with a traditional Venetian roasting profile, which means long roasting time at low temperature to produce all the nuances of the coffee beans. Caffè del Doge Amadi & Sambucco is a great espresso coffee for those who love an espresso with plenty of crema.